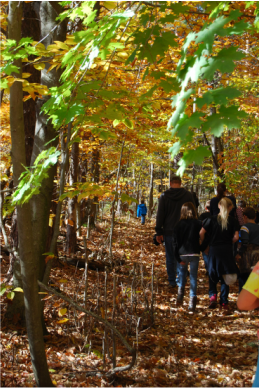 Hike the Huyck with Preserve staff and learn about the ecological communities of the Preserve. Choose a route along any of our trails through forests and along the shore of Lake Myosotis or Lincoln Pond. View our 120-foot waterfall and a variety of habitat types from early successional forest to old growth hemlock stands and beaver-constructed wetlands. Hikes are tailored to your group's physical ability and area of interest. ​Contact Anne Rhoads, Director of Conservation and Education, to schedule: anne@huyckpreserve.org.